San Francisco’s history as a brewing town is well documented. It’s no surprise that there’s also a robust community of beer geeks who are well served by bars with beer programs that go far beyond the standard American mega-brews. We did some pre-emptive carbo loading, and set off on a path around town to find some of the city’s best spots for suds. 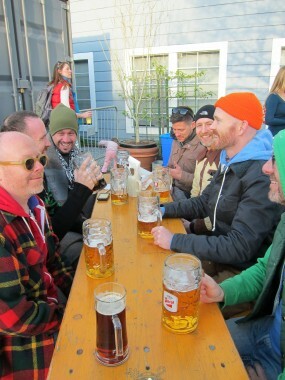 “It’s like Zeitgest, only they’re nice to you!” said my friend as we walked up toBiergarten (424 Octavia near Fell), the new-ish outdoor beer emporium in Hayes Valley.